— Bovin de Labbé, M.
Maria Bovin de Labbé´s Mindful Drumming is another way of meditating, another way to play. It´s about leaving the demands behind and take contact with your own, inner rhythms and use them as your guide, your core of power. Meditating with a drum/drums may feel easier than to meditate without it. The pulsating rhythms draws our focus and enhance the ability to stay, in our own body, mind and in the present moment. The aim of Mindful Drumming is to connect with the present moment, with our inner selves, our body, mind & soul. 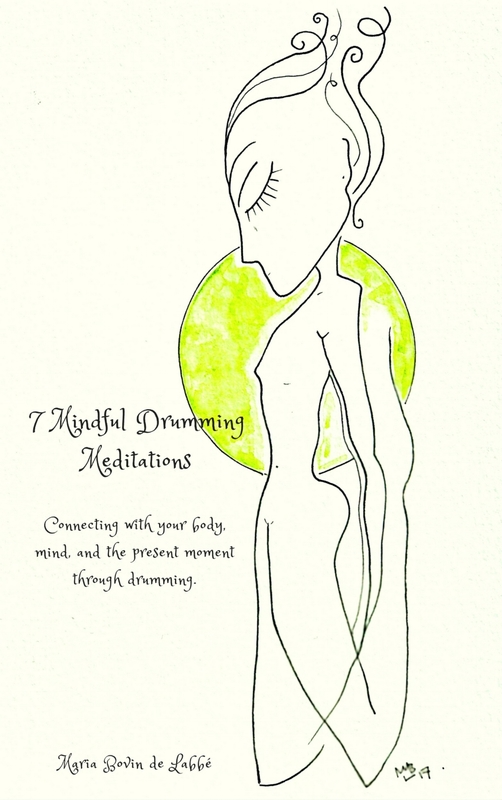 I'm so excited to announce that 7 Mindful Drumming Meditations. Connecting with your body, mind, and the present moment through drumming is LAUNCHED! It's a meditative, practical little ebook that will take you inside my meditation process and teach you some techniques to connect with your inner voice. The book is accompanied with original artwork by me. Maria Bovin de Labbé´s Mindful Drumming was started in 2010 by Maria Bovin de Labbé and is recognized as a Method of it´s own by the The Norwegian Music Therapy Association (NMTA).